"President's Cup" redirects here. For other uses, see President's Cup (disambiguation). 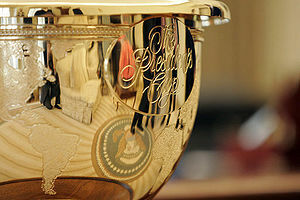 The Presidents Cup has been held biennially since 1994. Initially it was held in even numbered years, with the Ryder Cup being held in odd numbered years. However, the cancellation of the 2001 Ryder Cup due to the September 11 attacks pushed both tournaments back a year, and the Presidents Cup is now held in odd numbered years. It is hosted alternately in the United States and in countries represented by the International Team. The scoring system of the event is match play. The format is drawn from the Ryder Cup and consists of 12 players per side. Each team has a non-playing captain, usually a highly respected golf figure, who is responsible for choosing the pairs in the doubles events, which consist of both alternate shot and best ball formats (also known as "foursome" and "fourball" matches respectively). Each match, whether it be a doubles or singles match, is worth one point with a half-point awarded to each team in the event of a halved match. There have been frequent small changes to the format, although the final day has always consisted of 12 singles matches. The contest was extended from three days to four in 2000. In 2015, there were a total of 9 foursome doubles matches, 9 fourball doubles matches, and 12 singles matches. With a total of 30 points, a team needed to get 15.5 points to win the Cup. Until the 2005 event, prior to the start of the final day matches, the captains selected one player to play in a tie-breaker in the event of a tie at the end of the final match. Upon a tie, the captains would reveal the players who would play a sudden-death match to determine the winner. In 2003, however, the tiebreaker match ended after three holes because of darkness, and the captains, Gary Player and Jack Nicklaus, agreed that the Cup would be shared by both teams. From 2005 to 2013, singles matches ending level at the end of the regulation 18 holes were to be extended to extra holes until the match was won outright. All singles matches would continue in this format until one team reaches the required point total to win the Presidents Cup. Remaining singles matches were only to be played to the regulation 18 holes and could be halved. Although this rule was in force for five Presidents Cup contests, no matches actually went beyond 18 holes. The event was created and is organized by the PGA Tour. Each contest has an Honorary Chairman. These have been 1994: Gerald Ford, 38th United States President, 1996: George H. W. Bush, 41st United States President, 1998: John Howard, Prime Minister of Australia, 2000: Bill Clinton, 42nd United States President, 2003: Thabo Mbeki, President of South Africa, 2005: George W. Bush, 43rd United States President, 2007: Stephen Harper, Prime Minister of Canada, 2009: Barack Obama, 44th United States President, 2011: Julia Gillard, Prime Minister of Australia, 2013: Barack Obama, 44th United States President, 2015: Park Geun-hye, President of South Korea, 2017: Donald Trump, 45th United States President. There is no prize money awarded at the Presidents Cup. The net proceeds are distributed to charities nominated by the players, captains, and captains' assistants. The first ten Presidents Cups raised over US$32 million for charities around the world. Of the 12 matches, the United States team has won 10, the International Team has won 1, with 1 match tied. ^ Haggar, Jeff (September 30, 2013). "History of Presidents Cup TV coverage (1994-present)". Classic TV Sports. ^ Brennan, Christine (November 23, 2003). "Els-Woods playoff unable to settle Presidents Cup". USA Today. Retrieved November 19, 2011. ^ "The Presidents Cup – Format". Archived from the original on September 26, 2013. Retrieved August 21, 2013. ^ Shedloski, Dave. "Presidents Cup primer". PGA Tour. Archived from the original on June 22, 2011. Retrieved August 21, 2013. ^ "Past Results at The Presidents Cup". PGA Tour. December 8, 2014. ^ "The Presidents Cup Charity". PGA Tour. December 12, 2014. ^ "Australia awarded upcoming World Cup, Presidents Cup". PGA Tour. 9 October 2015. ^ "Quail Hollow to host 2021 Presidents Cup". PGA Tour. February 25, 2015. Retrieved February 25, 2015.